Our family has been doing business in central Florida for over 30 years. We take pride in being family owned and operated. We started out manufacturing blinds and draperies. We are dedicated to providing excellent customer service and quality products. At AAA Blinds, we offer to come out to your home or business for no charge. Why? For quite a few reason. First, it makes the buying process easier and more convenient for you as a customer. We do have a beautiful showroom with most of our products on display. But we can bring that showroom to you. 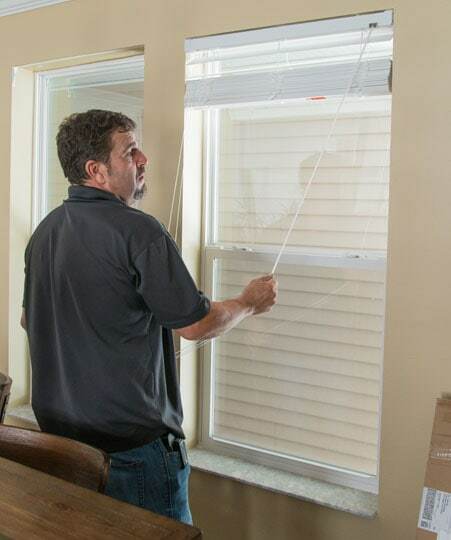 Second, us coming out to your home ensures proper manufacture and fit for your blinds or shades. Take the worry and hassle off your mind and let us take that responsibility. Third, seeing your windows will help us give suggestions on treatments to use or any special mounting that might be required. At AAA Blinds we offer many different name brand of blinds, shades, and shutters. We support our suppliers that manufacture products in the US. Especially the suppliers that are in central Florida. We are determined to bring Central Florida quality, affordable blinds and services. Let us assist you in finding the right window treatments for your home or business. The expertise of our staff means we can assist with your project whether your style is contemporary or traditional. When you work with our staff, they will help to ensure that you get the right product at the right price. One fact of AAA Blinds is well known in our community: We take care of our customers before, during , and long after the sale. AAA Blinds has been serving Lakeland, Winter Haven, Haines City, Davenport, Bartow, Plant City, Zephyrhills, and Lake Wales for over 30 years and has become an industry leader in its field. We look forward to assisting you in selecting the best products and designs by addressing your personal needs of privacy, energy savings and allocated funds. From a small valance to an entire house, each project will add beauty and value to your home while keeping up with the latest styles and color trends. Our staff will personally handle each step of the process from initial consultation to design, fabrication, and installation. Be sure to do business with a reputable company that has been around for a while. We get about five calls a day to fix blinds that other companies have put up and then gone out of business– don’t be that person! We warranty what we sell and stand behind our work 100%. We just had a guy bring in a vertical blind track we put up 20 years ago. His cleaning lady broke a carrier on the track. We repaired it, no questions asked! We’re here to help. Schedule your free in-home consultation with no obligation.